FANCY chilling over a glass of wine the next time you’re at the hairdresser’s – a trend that has taken off at hair hotspots may soon be a feature of Emma Rose Hair Design, a new hair salon in West End village. Due to have an official launch party on 17 November from 7pm – 9pm, Emma Rose, who already has a personal licence to serve alcohol, has applied for a premises licence so that clients can be offered a glass of wine or beer while they are at the salon. Though Emma only took over the business a few weeks ago, her experience in hairdressing comes from over 15 years as a trained hairdresser in Surrey and London’s Mayfair as well as the early introduction she had to the business through her parents’ hair salon in Sutton. 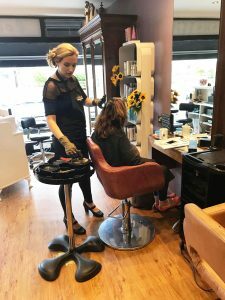 “The salon is a contemporary salon with three stylists, including myself, which offers all hair services including bridal hair, colouring and extensions. However, our plan is to serve drinks to clients, especially for weekend evening appointments. It has already gone down extremely well with the current clientele,” says Emma.